Electronic cigarette merchant accounts fall into this category despite the fact that the industry generates more than $3.5 billion in sales annually. The industry’s products grow increasingly popular because they provide additional alternatives to tobacco such as e-cigarettes, vaping equipment, e-juices and hookahs. Credit card processors don’t approve high-risk businesses because their underwriters must be convinced that the businesses are legitimate, that they don’t engage in illegal marketing and that they have strong credit scores. Blue Wave Merchant Solutions, however, operates on a different concept. We understand that the e-cigarette industry is lucrative, and we work hard to approve your account. Traditional banks make it difficult for startups in the electronic cigarette industry to get approved for credit card processing. These startups include website stores, brick-and-mortar stores and smoking accessory shops. Credit card processors require proof that applicants are not selling products for marijuana use or other illegal drugs. Age is a big factor because many of these products are bought by underage kids who often use the illegally obtained credit cards of their parents and friends. That can result in chargebacks. High chargeback rates brand your business as high-risk even if you get approved initially. High-risk merchants, if approved for credit processing, usually pay higher processing fees. During the application process, merchants look at the applicant’s credit rating, history of processing credit cards, industry rating and the chargeback rates for any previous businesses that the applicant operated. Any history of credit problems or negative bank balances tends to disqualify an applicant for credit card processing. Many e-cigarette merchants are small startup businesses that don’t have name recognition, strong credit histories or evidence of business responsibility over several years. The best approach for new merchants is to plan proactively by eliminating outstanding debts, building a strong credit history and banking a reasonable amount of money. Credit card processors can terminate the accounts of high-risk businesses if they meet or surpass a 3-percent chargeback percentage. The average chargeback rate of all businesses is around 1 percent. If processors suspect that a business is having difficulties with customer service, they assume that they could be held responsible for those chargebacks if the companies fail to make refunds. E-cigarette and vaping companies can reduce their chargeback rates by selling products only to adults and maintaining contact with their customers for at least a week after a sale. It’s also important to monitor product deliveries of all website sales. A shipping delay could result in an unnecessary chargeback. Making a strong effort to deliver outstanding customer service helps to ensure customer satisfaction and reduce chargeback rates. Although e-cigarettes and vaping are considered to be safer than cigarettes, the sellers are often categorized as tobacco-type products. International classifications of business types are assigned six-digit codes under NAICS, and the most common classification for e-cigarette merchants is 45399, which is NAICS code for Tobacco Stores. 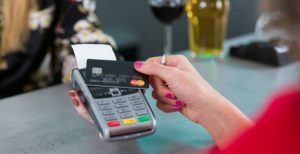 High-risk businesses can achieve high levels of success when they qualify for credit card processing in an industry that severely restricts online and credit card sales from potential competitors. Blue Wave Merchant Solutions provides the tools that aspiring merchants can use to even the odds. We offer high-risk processing to companies that don’t fit traditional business models. Operating your business at a professional level will help you to tap into the extraordinary opportunities that the flourishing e-cigarette and vaping industry offers. Customers pay through a payment portal. The portal send the data to the payment gateway. The data are forwarded to the payment processor. The processor confirms the charge with the bank. The bank confirms the transaction and sends funds to your business. You receive the money within 1-2 days. We approve 95 percent of our applicants in as little as 1-2 business days. There are no application or setup fees, and we even offer ways to mitigate your chargeback rate with proactive customer service. Contact use at Blue Wave Merchant Solutions today to apply for credit card processing services or learn more about our high-risk credit card processing services.